or pulling to one side? Have you noticed any difficulties when steering? A vibration or pulling to one side? It may mean that your wheel alignment is in need of attention. 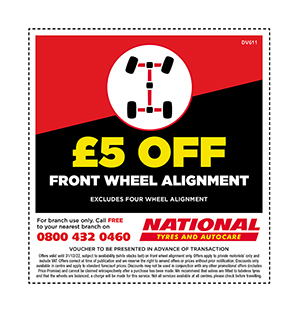 At National Tyres and Autocare we use specialist equipment to make quick and accurate adjustments to the front wheels of your vehicle and with a front wheel alignment cost of only £29 why not add this to your next safety inspection? Wheel alignment is also sometimes referred to as wheel tracking and should be part of standard vehicle maintenance undertaken by your local branch. This involves adjusting the angles of the wheels to the recommended position as outlined in a vehicle's manufacturer specification. It contributes to the reduction of tyre wear and to ensure the optimum performance and handling of the vehicle on the road. All new vehicles are sold with their wheels correctly aligned and adjusted, drivers should undertake initial checks on their new vehicle within the first 3 months; this will minimise the possibility of the tyre specifications drifting outside of the manufacturer's guidelines. Failure to check this may lead to unnecessary pulling or wear on the tyre. Drivers may not notice potential defects at first but after time it can cause lasting damage. Typical side effects are steering vibration which can cause driver fatigue through constant pressure or the vehicle pulling to one side. Tyre wear is not the only area of the vehicle that can suffer if correct wheel alignment is not set, braking distance, driving quality and even fuel economy are all affected. 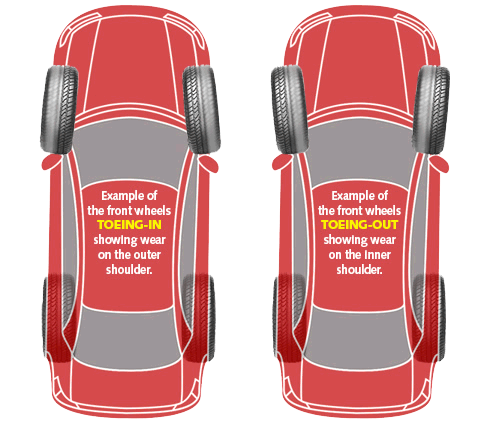 Incorrect wheel alignment, can also apply undue pressure to tyres which can cause them to lean into one another. When that happens your vehicle faces resistance on the road surface making the car work much harder to drive along in a straight line therefore burning up more fuel than normal which is bad for your wallet and the environment. The expert technicians at National Tyres and Autocare use Supertracker Wheel Alignment equipment, which offers a fast and accurate system for your front wheels, and is considered the most trusted equipment in the UK. The experts at National Tyres and Autocare have used this equipment for a number of years due to its safety credentials reliability and efficiency. 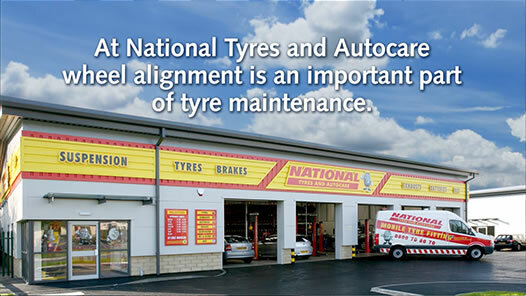 This enables the branch staff to quickly check the front wheel alignment. Supertracker's laser wheel aligners are available in National Tyres and Autocare branches nationwide.